The ruins of Kastro overlook the northern Aegean Sea. For those wishing to explore beyond the south coast resorts and beaches of Skiathos, there are a variety of activities, day trips and things to do. Skiathos has a rich and varied history, having been laid siege to, invaded and occupied several times by various forces throughout the ages. To access many of these historical places, especially those located at the north of Skiathos, you will need to travel either by boat or via the many gravel tracks, walkways and trails that lead through the forested heart of the island. As Skiathos is a relatively small island, many people choose to forego joining the organised trips that the tour operators lay on, preferring instead to explore the island under their own steam. This option is both easy and comparatively inexpensive. The original capital of Skiathos was Skiathos Town as it is today. However, for a period during the middle ages, Skiathos Town was abandoned by it's inhabitants who fled northwards from marauding pirates. They settled in an area known as Kastro and built themselves a fortified town. The remains of this 14th century and now abandoned town can be found perched upon a hill overlooking the northern Aegean Sea. Of the twenty churches and roughly three hundred houses that were once here, only two churches, part of the wall and gate of the old fort, as well as a half-ruined mosque and a cannon have survived to this day. One of the houses has been rebuilt, however restoration efforts seem to have run out of steam. To get to Kastro, you can either take the road from Skiathos Town, which is metalled for only half the journey, or sail around to the north of the island on one of the day trip boats. This is the preferred route for most tourists. There is also a shingle beach at Kastro, at the foot of a series of steep steps that lead down from the ruins of the old town. The beach has a small beach bar that is popular with the arriving boat loads of day trippers. Popular destinations for many visitors to the island are the monasteries of Evangelistria and Kounistria, both of which are rich in history and both also enjoy picturesque settings. Of these two monasteries, the smaller is Kounistra and can be found just outside Troulos. 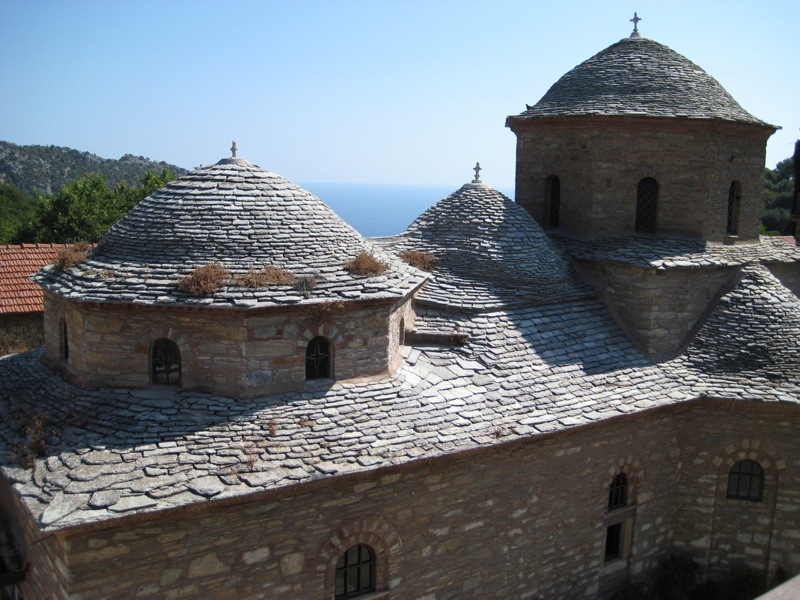 This monastery is where the holy icon of Panaghia Kounistra, the Patron of Skiathos, was found. Kounistra monastery is set in a very pretty area and has a taverna within its walls. Inside the monastery you will find beautiful gilt wooden iconostasis decorated with vine-leaves and grapes. The monastery of Evangelistra is located about five kilometers north of Skiathos Town deep in the most forested countryside. This monastery was founded in 1794 and construction was completed circa 1806. This monastery played a significant role in modern Greek history. It wash here that soldiers who were engaging the Turks as part of the Greek War of Independence during the early 1800s took their oath of allegiance under the first independent Greek flag. The monastery is a cruciform Byzantine church that boasts three domes. Frescoes can be found in the sanctuary, however the monastery's real treasure is a magnificent wall of carved icons and religious paintings know collectively as an iconostasis. Annually, on the 15th of August, the Ceremony of the Burial of Our Lady is performed here. Skiathos boasts several walking possibilities which may be of interest, with the walks mostly following the dirt tracks and trails that lead through the forested heart of the island. Some of the quietest and most spectacular beaches on Skiathos are located on the northern undeveloped coast, access to which is by footpath or boat. As such there are several short and medium distance walks leading from both Koukounaries and Troulos to these beaches. There are also walks out into the hills and mountains passing beaches, churches and monasteries along the way. These walks follow mostly circular routes that can take up to several hours to complete. 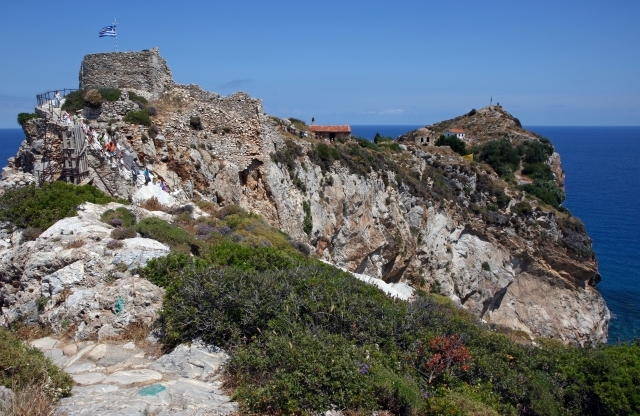 Walking on Skiathos can be quite arduous, especially during the heat of the summer months. However, the countryside, the quiet secluded beaches and the fabulous vistas that can be discovered along the way, make the effort well worth while. 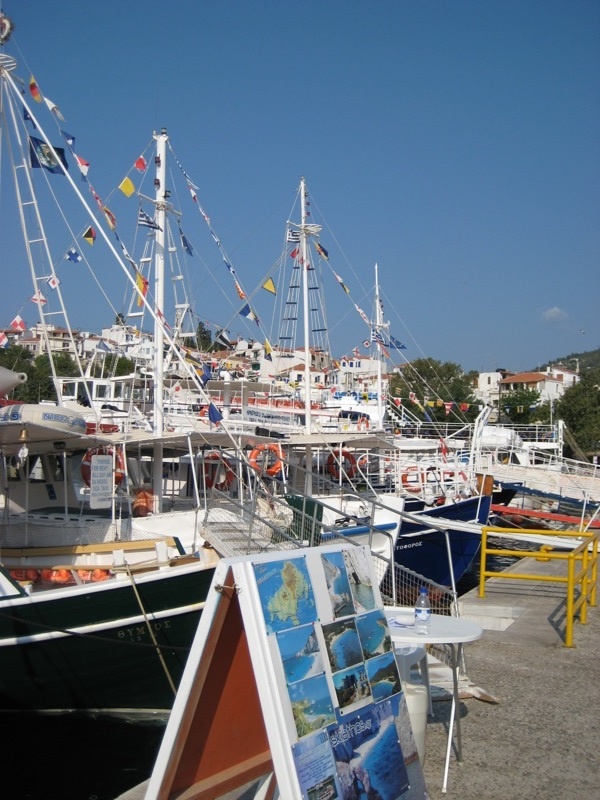 Most of the boat trips start in Skiathos Town. One of the most popular activities for visitors to Skiathos is to take one of the many boat trips that set sail from the old port in Skiathos Town. Trips are available to see the north coast and beaches of Skiathos, with most of them calling in at Lalaria Beach and Kastro. A short distance off the coast of Skiathos Town the three small islets of Tsougria, Tsougriaki and Arkos can be found. These uninhabited islets are a popular destination for day trippers seeking to get away from the hustle and bustle of the southern Skiathos resorts. Not only are visitors rewarded with some peace and quiet, but also several lovely sandy beaches on which to spend the day. Day trips to these islets operate daily through the peak season from the old port of Skiathos Town. Skopelos is the nearest inhabited island to Skiathos and is a great place to visit. This eastern neighbouring island is not only much larger, but is also much quieter and more relaxed than Skiathos. To get to Skopelos, you can take one of the ferries or hydrofoils that operate several times a day from the new port of Skiathos Town. The ferries and hydrofoils call into the northern town of Loutraki before continuing on around to Skopelos Town. For full details of all that is available to see and do in Skopelos, check out our sister site: Skopelos-Greece.net. The ferries and hydrofoils also operate services to Alonnisos. This is another inhabited island that lies beyond Skopelos to the east. Services are also available to the Greek mainland, though because of the distances involved it may be better to plan an overnight stop in order to make the most of these destinations. Those interested in Greek literature and it's history can find the house of Alexander Papadiamantis in Skiathos Town. Papadiamantis was one of Greece's most revered writers and authored over a wealth of short stories and several novels. He is the most famous Greek to have come from Skiathos and as such the locals are justly proud of him and his works. The house where Papadiamantis spent his final years can be found tucked away at the end of a small alleyway near the Bourtzis, the area of Skiathos Town between the two harbours. The two storey house, built by Papadiamantis' grandfather between 1850 and 1860, is now a museum. The ground floor serves as a general museum of Skiathos, whilst the upper floor is kept as it was during the author's life.